Help us spread the word about BrainTech 2019! Find below the promotional toolkit for the event, including the official 2019 banners, presentation slides, flyers and other material. 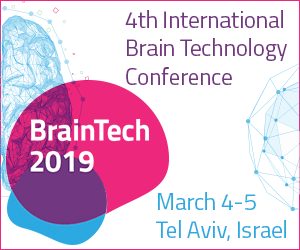 We invite you to use the materials to promote BrainTech 2019 within your network, on social media platforms, in lectures and meetings. Invite your peers to join you in Tel Aviv! Follow us to get all updates and share them with your network using #BrainTech19. Add these slides at the end of your presentations, at appropriate meetings, and show on screens at events between presentations.